Straight from the library--the strange and bizarre, ready to be checked out! From a patron's missing wetsuit to the scent of crab cakes wafting through the stacks, I Work at a Public Library showcases the oddities that have come across Gina Sheridan's circulation desk. Throughout these pages, she catalogs her encounters with local eccentrics as well as the questions that plague her, such as, "What is the standard length of eyebrow hairs?" Whether she's helping someone scan his face onto an online dating site or explaining why the library doesn't have any dragon autobiographies, Sheridan's bizarre tales prove that she's truly seen it all. 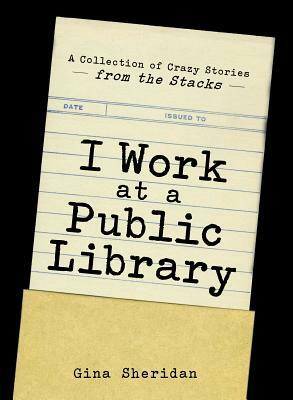 Stacked high with hundreds of strange-but-true stories, I Work at a Public Library celebrates librarians and the unforgettable patrons that roam the stacks every day. Gina Sheridan is a librarian in St. Louis, Missouri, where she lives with her partner Travis. When she's not collecting stories, she's exploring cemeteries, dressing up her cats, or taking pictures of things overlooked by regular people. You can visit her website at www.iworkatapubliclibrary.com.